Last week our Photo of the Week showed the front side of the medal presented to players who took part in the official opening of the club grounds at the Burgery in August 1998. This week we show the reverse side with the inscription commemorating the event. Our ever popular Jack the Joker fundraiser continues this Sunday night in Alice O’Connors where the jackpot is €2,800 as on Sunday night last Callum Ferncombe was drawn out of the drum and chose card number 7, which when turned was not the Joker though he did win €50. Declan Byrne and the Morning Club won €25 each. As well as our group of ticket sellers tickets can be purchased from Convenience Store Ballinroad, Village Flowers, Spar, Mousies Takeaway, Minnies Bar and Crotty’s Corner Bar. This Sunday afternoon last our Junior B Footballers made the long journey to Knockaderry in Limerick to take on Sneem Derrynane of Kerry in the Semi Final of the Munster Junior Football Competition. This competition is organised by the Knockaderry club and has been held for the past number of years for the winners of the County Junior B Football Championships. On the day our opponents proved too strong for us and ran out deserving winners. Well done to the players and management for making the long trip on Sunday and for representing the club so well. As teams start back training over the next few weeks we remind all team managers that they must book the pitches/astro turf with Michael Donovan prior to training and also managers are asked to remember that the main pitch remains closed until further notice. Our club bingo will continue this Sunday night in the the CBS Hall with a jackpot of €950. On behalf of all in the club we would like to extend our deepest sympathies to family and friends of the late Francie McGovern, McCarthyville who passed away recently. We intend to hold a sponsored walk and run on the 13th March at 5.30 pm in aid of the Feile 2016. Everyone is welcome to participate including young and old, so grab your trainers and put this date in your diary and help raise a few Euro to host this prestigious event in June. Our Under 16 footballers start their county championship campaign this coming weekend against Tramore. This team has been preparing away quietly for the last few weeks and hopefully they will get their campaign off to a winning start. All in the club wish everyone involved well. Our Under 14 team were due to take on Tramore in the Under 14 Football Championship first round game on Sunday last. However due to poor weather conditions this game was called off along with all other under 14 matches in the county. This game will now have to be played at a later date. The next game for this group of players is pencilled in for a fortnight’s time against Gaultir. Membership for 2016 for our juvenile players is now due. We ask for parents to co-operate with us and pay the membership as soon as possible. This is to make sure that all players are insured as if they are not members they are not insured which is outside our control. Under eleven hurling training continues this Friday night between 6 and 7 pm. New members are always welcome and membership forms will be handed out on the night. Training for the Under 10 and Under 13 age groups will go ahead again this Friday night in the wall ball. The Under 10 team will train between 7 and 8 pm and the Under 13 team will train between 8 and 9 pm. All are welcome to attend. On Saturday week last the 13th February our Under 8 football team took part in a blitz in Kilgobinet. On the day all the lads performed well and all who took part really enjoyed the experience. Well done to all. On Saturday morning last our Under 9 hurling team took part in their first blitz of the year in Kilgobinet. Again all accounted themselves well on the day and showed steady improvement on the year before. All must have been out practising against their walls at home over the winter. The action continues this weekend for this group of players when they will travel to the same venue for a football blitz. The underage outdoor hurling season began on Saturday morning last for the groups between Under 5 and Under 8. The Under 9 team would usually be included in these sessions too but were playing a blitz last weekend and have another one coming up this weekend. These sessions continue this Saturday February 27th 2016 for anyone between the ages of 5 and 8. New members are always welcome and hurleys and helmets will be available on the day. These sessions will continue weekly on a Saturday morning between 10.30 am and 11.30. This and next Saturday which are February 27th and March 5th will be allocated as membership days where we hope to collect all the membership for the relevant age groups. Our minor football team got their championship up and running on Sunday morning last against the Nire. After a hard fought game throughout our lads came away with a fairly comfortable victory in the end. We played some good football throughout but like in all games we need to show improvment as we go on in the championship if we are to progress. This week's photo shows the medal awarded to each player who participated in games to mark the official field opening at the club grounds at the Burgery in August 1988. Our ever popular Jack the Joker fundraiser continues this Sunday night in Alice O’Connors where the jackpot is €2,600 as on Sunday night last Claire Cosgrave was drawn out of the drum and chose card number 28, which when turned was not the Joker though she did win €50. Marie Burns and Eleanor Hickey won €25 each. As well as our group of ticket sellers tickets can be purchased from Convenience Store Ballinroad, Village Flowers, Spar, Mousies Takeaway, Minnies Bar and Crotty’s Corner Bar. This Sunday afternoon our Junior B Footballers will make the long journey to Knockaderry in Limerick to take on Sneem Derrynane of Kerry in the Semi Final of the Munster Junior Football Competition. This competition is organised by the Knockaderry club and has been held for the past number of years for the winners of the County Junior B Football Championships. Our opponents on Sunday are sure to present a significant challenge but we wish Pat O’Brien and all the team the very best of luck, and have no doubt they will do the club proud, just as they did in winning the County Championship last year. Our club bingo will continue this Sunday night in the the CBS Hall with a jackpot of €900. On behalf of all in the club we would like to extend our deepest sympathy to the family and many friends of the late Michael Collins who so tragically passed away last week. We especially send our sympathy to his wife Vera, daughters Eimear and Niamh, sons Evan and David, mother Kathleen, brothers Jim and Ger and sisters Marita and Mary on their terrible loss. Despite the fact that Mick had been in hospital in Dublin at the time of his passing, the news which broke throughout the parish on Tuesday morning last shook all who heard it to the very core. If ever there was a man that we all believed would live to good old age, it was Mick Collins, such was his love of life and the energy levels he put into any job he took on. The esteem in which Mick was held outside of our club was always known to us, but it was certainly reinforced last week as messages of sympathy and support flooded in from clubs both inside and outside the county, all expressing a similar sentiment of shock at Mick’s death and all speaking of how they would miss dealing with Mick in the years ahead, as like all who dealt with Mick, they found him to be a complete and utter gentleman to work with. Speaking with those who had played against Mick during his lengthy playing career and indeed those who had refereed his games they all spoke of a great competitor who gave of his all during the game, who always played within the rules and once the full time whistle went shook hands and left whatever had taken place during the match on the field. This description of Mick is familiar to us all in the club as for so many years we came away from games in admiration of his performances in the number three jersey and at the way he would inspire all those around him in his own unique way. Like all great players and leaders it was when the team’s back was to the wall that Mick was seen at his very best, and there is no doubt that those great displays of courageous defending, many times against all the odds, will be recounted by all who were lucky enough to see him play, for many years to come. Mick began his playing career with the club at a time when our Juvenile teams were enjoying much success and in 1975 at just 12 years of age Mick was part of a panel that won the Western Under 14 Football Championship defeating Affane in a replayed Western Final by 4 points. Two years later Mick lined out at full back for both the Under 14 hurling and football teams who had a fantastic year. The hurlers won the Western Final with victory over Dungarvan, before losing out to a very strong Mt. Sion team in the County Final but they atoned for this loss by defeating the Monastery side by one point in the replay of the football County Final, having earlier defeated Kilrossanty in the Western Final. Mick’s brothers Ger and Jim were also on both of those panels and they would go on to soldier together in the club colours in the years ahead, with Mick and Ger forming two thirds of Abbeyside and Ballinacourty full back lines for a great many years. 1977 also saw Mick win his first hurling honours with the club as the under 16 hurlers defeated Dungarvan in the final of The Meladon Tournament, which was staged to commemorate Mrs. Niall Flynn’s horse, Meladon’s great victory in Cheltenham. 1979 saw Mick lead the Under 16 footballers to Western Championship glory as team captain, with victory over Kilrossanty in the Western Final but unfortunately De La Salle were too strong in the County Final. Mick was also on the Minor football team that year and their season followed an identical path to that of the Under 16 team as they also defeated Kilrossanty in the Western Final before losing to De La Salle in the County Final. Success on the playing fields continued to come over the next few years as in 1980 Mick was on the Minor football team that won the Western and County Championships with victories over Kilrossanty and Ronamore to claim the first part of an historic three in a row of County Minor Championships. 1981 was a very special year for Mick as they retained the County Minor Championship defeating Tramore in the County Final, and his displays for the minor team earned him a call up to the Senior team where he was part of the panel that won the County Senior Football Championship defeating Ferrybank in the County Final. Ferrybank would gain some revenge for this loss the following year in the Under 21 Football County Final, after Mick had claimed a further Western title with victory over Kilrossanty. Whilst the 1980’s seemed to have been full of promise for the club, unfortunately this did not materialise on the fields of play as the combination of emigration robbing the club of many of its players and paying off the debt on the new club grounds seemed to impact on the results of the club teams. Throughout this very difficult time for the club, Mick was one of the leading lights for the club and he would feature for the both the County Senior Hurlers and Footballers, having earlier played Minor and Under 21 for the County. Mick was great supporter of Waterford County Teams and indeed he got involved as a selector with the County Development Squads after he retired from playing. In 2007 Mick worked with Liam “Chuck” O’Connor to lead Waterford to a famous victory in the Tony Forristal Tournament where they beat Tipperary in the final. Current Waterford Senior Hurler Jake Dillon was on that team, but typical of Mick’s humility it was never something he would mention in conversation and would almost be embarrassed if it was brought up in his company. By the early 1990’s a new group of talented underage hurlers were beginning to emerge on the club Intermediate team and this side soon became very competitive in the Western Championship, with Mick’s steadying influence in the full back line crucial. After many near misses the Western Championship was won in 1994 with a great victory over Cappoquin in the final. A much fancied Erins Own team were to be the opponents in the County Final, and after 60 minutes the sides were level thanks in no small way to the performances of Mick and his great friend Conor Clancy who had a fine game at centre forward on Damien “Bugsy” Byrne. Unfortunately Erins Own would win the replay, but hope of a return to Senior Hurling was building among all in Abbeyside. 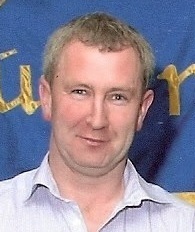 The Intermediate Hurling selection committee in 1996 led by manager Dave Sheehan began the year by appointing Mick as team captain, a wise appointment as his composure and inspirational leadership qualities were vital in leading the team to some narrow wins in the Western Championship culminating in victory over Ring in the Western Final. The team had been improving game by game and the hurling coaching of Nicky Cashin was starting to bear fruit. The first half of the County Final against Ferrybank saw the team put in a nervy performance as the trailed by 7 points at half time, but as in many other days the calm reassuring words of Mick at halftime and his magnificent performance in the second half helped the team to a historic victory, and it was fitting indeed that Mick accepted the cup in Fraher Field and led the team back to the ranks of Senior Hurling. Like many teams who make the progression to Senior Hurling, we struggled to cope with the step up in standard and unfortunately slipped back to the Intermediate grade. Mick continued to answer the club’s call though as he lined out for both Club hurling and football teams. In 1997 our Senior Football team were relegated to the Intermediate grade somewhat controversially and in 1998 Mick came out of football retirement to play on the Intermediate team and ensure the club returned to the ranks of Senior Football quickly. It was his performance in the Western Semi Final that year that sticks in the mind of all who witnessed it, as with time running out in the match we trailed Clashmore by two points in Stradbally in atrocious weather conditions. Having witnessed a number of scoring opportunities spurned throughout the game Mick took matters into his own hands and soloed the length of the field from the full back line, leaving a trail of would be tacklers in his wake, on his way to the Clashmore goal mouth where he laid off the ball to another of his great team mates Sean “Hiker” McGrath, who duly buried the ball to the roof of the net, to steal victory in the last seconds of the game. The Western and County Finals over Ballyduff Upper and De La Salle were somewhat more straight forward and we have been in the ranks of Senior Football ever since, but one dreads to think what might have happened had “Collins” not gone on that solo run!! Mick continued to play on for both club adult teams and in 2000 he lined out in the Intermediate hurling team that beat Fourmilewater in the Western Final, before losing the County Final to Ballyduff Lower. Two years later and almost 30 years after he had first pulled on and Abbeyside Jersey Mick was still manning the edge of the square as we were unfortunately defeated by Ardmore in the Western Intermediate Final. Whilst Mick had retired form playing Intermediate in 2003 he was not to be lost to the club and he was appointed as an Intermediate Hurling Selector along with John Foley and Frank Sweeney. Mick’s role in helping and guiding many of the young players on that team cannot be overstated as whenever he spoke he commanded total respect by all those present, and his presence on the sideline offered great reassurance to those on the field of play. After defeating Shamrocks in the Western final the team traveled to Walsh Park and after a wonderful game against Erins Own emerged victorious to return to Senior Hurling where we have remained since. Mick returned as a Senior Hurling selector in 2006 for three years working with Bernard Gorman during which time the club won the County Division 1 League Title, the Sargent Cup and came within a whisker of that elusive Senior Hurling County Championship in 2008 when we were defeated De La Salle in awful weather conditions. During all of these years Mick gave unselfishly of his time training juvenile teams in the club and many of our current club adult players came through Mick’s hands out on the training field. All of those who were coached by Mick speak of the great will to win and refusal to give up that he instilled in them coupled with sense of fair play and above all sportsmanship. Many of those teams which Mick was involved with won County Titles right up to the Minor Hurling team which won County Honours last year. Whilst Mick was indeed a great competitor on and off the field he also loved the social side of the GAA and the friendships made through it. This perhaps explains how he became involved in reforming the club’s Junior B hurling team a number of years ago. This team benefitted enormously from Mick’s great organisational ability and most of all his great man management and people skills, as whilst the team were always extremely competitive, they never lost that sense of fun and enjoyment from our games which Mick so loved. Although Mick would dearly have loved to have won a County Championship with this team , which they nearly did win in 2013, where they were unfortunately defeated by Erins Own, Mick passionately believed that this team served a much greater importance in the club, namely giving anyone who wanted it the opportunity to play hurling for Abbeyside. Last year Mick was involved in our Junior B Football Team who won the County Championship, where he deputised for team manager Pat O’Brien on County Final day. This year Mick was due to be a selector with both our Under 21 sides and our Junior Hurling team. As always with the man he was willing to help out with training teams where ever the need arose in the club. Indeed for many years he helped out with training the teams in Garrranbane NS where his beloved wife Vera worked and also with our Abbeyside Ladies Football teams. As if he was not already giving enough of his time to the club, Mick was very involved in all of the development work that took place in our club grounds, in recent years. Through his work with the ESB and on his farm at home Mick had great expertise, which was always available to the club whenever it was required. He put in untold voluntary hours of work erecting netting behind the goals, helping in the erection of floodlighting on our pitch and more recently in developing our new club pitch. As was always the way with Mick he would never seek any recognition for this work preferring to work away quietly in the background. Since our Jack the Joker fundraiser began a number of years ago Mick was one of our best sellers of tickets and was an ever present for the draw on Sunday nights in Minnies or Alice O’Connor’s where he would revel in the craic that companied the draw. Whilst all of us in the club are still mourning Mick’s death our sense of loss is nothing compared to that being felt by his family. Mick was a great family man and took great pride in the performances and achievements of his family especially those of his children. Together he and Vera raised four wonderful children who display all that is good about their parents. As mentioned earlier Mick was a man of great humility and never boasted in any way about the sporting or other achievements of Eimear, Evan, David or Niamh but there can be no doubting the great pride and love he had for them, especially in their many honours won in the Abbeyside/Ballinacourty, Abbeyside Ladies Football or Ring Camoige Jersey. It is also fitting that we thank Mick’s family, but especially Vera, for the huge support they gave him as without this help and support it would have been impossible for Mick to devote so much of his energy to our club. It is safe to say our club would be all the poorer without the fruit of his work. The enormous crowds who turned out to show their respects to Mick’s family last Thursday and Friday proved beyond any doubt that he was one of the most respected and admired figures ever from our club. Within the club his popularity transcended the generations as his loss was mourned by teenagers to those long since retired from playing, with club members traveling from all over Ireland and indeed beyond these shores to show their respect and appreciation for the service given by Mick to our club. From outside our club they came from near and far to pay their respects to one of life’s gentlemen who left his mark on all who met him thanks to his love of life and his genuine concern for others. In the weeks, months and years to come our club teams will face many the battle and uphill struggle on the field of play. All we can ask is that they display some of Mick’s courage, composure, skill, determination and his “get up and get on with it” approach to these battles and perhaps even more importantly his great sense of sportsmanship during the game and after the full time whistle. There would be no better way to honour one of our greatest ever servants, Michael Collins, fíor fear uasal agus laoch ceart. We intend to hold a sponsored walk and run on the 10th March in aid of the Féile 2016. Everyone is welcome to participate including young and old, so grab your trainers and put this date in your diary and help raise a few Euro to host this prestigious event in June. Our under 16 team will train again next Tuesday and every Tuesday evening for the foreseeable future. The underage outdoor hurling season is nearly upon us again. The season starts this Saturday February 20th 2016 for anyone between the ages of 5 and 10. New members are always welcome and hurleys and helmets will be available on this date for new members. These sessions will be weekly on a Saturday morning between 10.30 am and 11.30. The next two Saturdays after this date which are February 27th and March 5th will be allocated as membership days where we hope to collect all the membership for the relevant age groups. On Tuesday morning last our club woke up to the terrible news that Michael Collins had passed away after a short illness. In tribute to Mick, this week's photo shows an Abbeyside Junior Hurling team managed by him lining out in Fraher Field a few short years ago. Mick believed passionately in keeping lads involved in the club and his coaching of these teams certainly brought that about. May he rest in peace. Our ever popular Jack the Joker fundraiser continues this Sunday night in Alice O’Connor’s where the jackpot is €2,400 as on Sunday night last Frankie Wright was drawn out of the drum and chose card number 27, which when turned was not the Joker though he did win €50. Shay Young and Kevin and Mark won €25 each. As well as our group of ticket sellers tickets can be purchased from Convenience Store Ballinroad, Village Flowers, Spar, Mousies Takeaway, Minnies Bar and Crotty’s Corner Bar. This Saturday afternoon at 2:30pm we take on The Nire in the first round of the Western Championship in The Gold Coast. Love was certainly in the air last week in Abbeyside as the two Marks popped the big question to their respective girlfriends. On behalf of all in the club we send our congratulations to Mark Ferncombe and Cassandra Dee and also to Mark Gorman and Keeva Fennelly on their engagements last weekend and hope that both lads won’t miss too much training preparing for the big day. Our club bingo will continue this Sunday night in the CBS Hall with a jackpot of €850. We intend to hold a sponsored walk and run on the 10th March in aid of Féile 2016. Everyone is welcome to participate including young and old, so grab your trainers and put this date in your diary and help raise a few euro to host this prestigious event in June. All in the juvenile club would like to congratulate two young players in the club who recently picked up awards at our medal presentation night to recognise their achievements in representing Waterford in the Primary Game in 2015. The players that were honoured were namely Daire Slevin who represented Waterford in football and Alex Norris who represented Waterford in hurling. Both these young men show a great attitude towards their Gaelic Games and both indeed should have very bright futures in years to come for our club. Well done to both. It was with tremendous shock and sadness that we in CLG Dún na Mainistreach / Baile na Cúirte learned this morning of the death of our great clubman Michael Collins. Mick's commitment to our club was total both as a player down through the years and later as a selector and manager. There can hardly be an adult player who was not trained by him either at juvenile or adult level over the years. Indeed this year, Mick was to be part of the management of our U21 and Junior hurling and football teams. If ever work was needed at the club grounds, Mick was always there to lend a hand. His loss to our club will be profound. To Mick's wife, Vera, sons David and Evan, daughters, Eimear and Niamh, mother Kathleen, brothers and sisters, all in CLG Dún na Mainistreach / Baile na Cúirte offer our deepest sympathies at this most difficult time. Ar dheis Dé go raibh a anam. This week's photo comes from February 1985 and shows the front cover of a club newsletter delivered around the parish that month. It seeks support from the public in a variety of areas, administration, playing, coaching and fundraising. Little has changed over the years!! Our ever popular Jack the Joker fundraiser continues this Sunday night in Alice O’Connor’s where the jackpot is €2,200 as on Sunday night last Joe Kelly was drawn out of the drum and chose card number 38, which when turned was not the Joker though he did win €50. Jimmy Lennihan and Lalu O’Connor won €25 each. As well as our group of ticket sellers tickets can be purchased from Convenience Store Ballinroad, Village Flowers, Spar, Mousies Takeaway, Minnies Bar and Crottys Corner Bar. On Saturday night last there was a fantastic turnout to our medal presentation in Scoil Mhuire, Abbeyside. On the night we presented medals to our victorious Minor, Under 21 and Junior teams and we thank Patrick Hurney and Conor Prunty for presenting the medals on the night. After the medal presentation Club Chairman Bernard Shields made a presentation to both Patrick and Conor to mark their selection as Footballer of the Year and Underage Footballer of the Year respectively for 2015. We would like to thank Scoil Mhuire for the use of their facilities, Pat O’Brien for the fabulous food he provided and the ladies who helped with serving the food to all those present. Our club bingo will continue this Sunday night in the The Park Hotel with a jackpot of €800. On behalf of all in the club we would like to extend our sympathies to the family and friends of the late Cyril Healy, Ballycoe who passed away recently. There was a large attendance at Ballinroad Hall last Friday night for our medal presentation for our successful teams of 2015. The teams that were represented on the night were our Under 13 team, our Under 14 team, our Under 15 team and lastly our Under 16 team of 2015. It was a fantastic to see so many young hurlers and footballers from our club pick up so many medals. There was also a huge turnout of parents on the night which made the occasion all the more special for the lads that were collecting medals. Our medals this year were presented by two very loyal clubmen, Austin Flynn who won an All Ireland medal with Waterford in 1959 and of course current Footballer of the Year in Waterford Patrick Hurney. We would especially like to thank these two gentlemen for taking time out of their busy schedules to be present with us on the night. We would also like to thank Tomas Kiely who acted as MC and as usual he went very professionally about his business. Also thanks must go to our Secretary Audrey Hallahan and Chairman Joe Cleary who put in great work to make sure everything ran smoothly during the event and decorating the hall before the event etc. However they were not alone and we would also like to say thanks a million to all the parents who brought along refreshments on the night and of course our wonderful ladies committee who as usual were brilliant at catering to such a big crowd and who helped tidy the hall up afterwards. All in all this night was a great success and everyone deserves a big pat on the back. Our Under 16 team began training again last night Tuesday (2nd February) and they will continue to train every Tuesday for the foreseeable future. Under 11 football training continues this Friday night between 6 and 7 pm. New members are always welcome and membership forms will be handed out on the night. Training for the Under 10 and Under 13 age groups will go ahead this Friday night in the ball wall. The Under 10 team will train between 7 and 8 pm and the Under 13 team will train between 8 and 9 pm. All are welcome to attend. Our club half zipped tops were favourably received by all and sundry and really do look the part. Well done to Elena Carmody and Niamh Murphy who organised sponsorship of same from Expeditors of Cork and for this we are extremely grateful. Well done also to Richie and Hannah Walsh who organised the ordering and distribution of the tops. Our AGM takes place in the clubhouse on Wednesday, February 10th at 7:30 pm where we hope to set our club on a firm foundation for the coming year. All are welcome to attend on the night. The U13 medal presentation will be on Sunday, 14th February in the Tennis Club at 7.30pm. U14 training continues on Tuesday from 7 - 8pm in the hurling wall. There will be a Féile fundraising walk on Sunday, March 13th. The next Féile committee meeting will be this Thursday, 4th February.